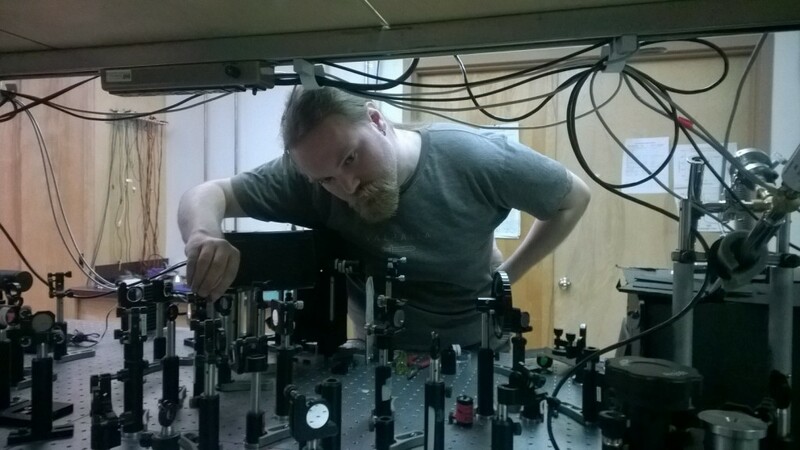 Brian Johnson (Ostroverkhova group) has received the 2015 Physics Graduate Research Award in recognition of his work on organic semiconductors. Brian Johnson with optical setup. He describes his work as follows. I have focused on studying the charge photogeneration, carrier transport, and carrier trapping mechanisms in small molecule organic semiconductor materials, specifically, functionalized derivatives of pentacene and anthradithiophene. I developed a computational model which simulates experimental data and fits those simulations to measured data to extract quantitative material parameters. My work helps to answer one of the most important open questions in organic semiconductor material physics: what, exactly, is the process by which charge photogeneration happens? Classic models have been shown to be incomplete, and my work fits into gaps in the current research towards this topic, as much more work has been done on polymers than in small molecules, and investigations of nanosecond time scale carrier dynamics are rare. This work is important to the development of new materials for organic LEDs, solar cells, and transistors. Posted in Awards, Graduate Students.